Having seen what New Kids On The Block had achieved around the world as the '80s became the '90s, British record companies wanted in on the boy band action. In their threes, fours and fives, the boy bands came thick and fast - and some even had success in Australia as well. Like the group that debuted on the ARIA singles chart this week in 1993. One of the two biggest boy bands out of the UK during the '90s, they were everything NKOTB wanted to be when they overhauled their image in 1991: streetwise, cool and just the right amount of bad. Speaking of streetwise, cool... OK, I'm joking. The number 1 single this week in 1993 was still "I Will Always Love You" by Whitney Houston, which registered its sixth week on top. Another song from The Bodyguard was the first of four soundtrack singles to miss the top 50 this week. This cover of the Bill Withers tune was produced by Clivillés & Cole and featured vocals from the ex-Seduction member and future RuPaul's Drag Race judge. Taken from Mo' Money (the same movie that'd featured "The Best Things In Life Are Free"), this track completed a trio of top 50 misses for the New Edition lead singer. Also from Mo' Money, this ballad brought vocal harmony group Color Me Badd back to the top 100 - something previous singles "Heartbreaker" and "Slow Motion" couldn't manage. The original film was a box office sensation in 1992, but this cover of Little Peggy March's 1963 chart-topper by the singing nuns wasn't a hit this time around. The soundtrack album reached the top 10 this week, however. As lead singer of The Georgia Satellites, he'd made two appearances on the ARIA top 50 - with "Keep Your Hands To Yourself" in 1987 and the following year's cover of "Hippy Hippy Shake" for Cocktail. In 1990, Dan Baird left the Southern rock band to strike out on his own and saw this punctuation-driven lead single from debut solo album Love Songs For The Hearing Impaired reach the US top 30. Maybe if it was called "I Love You Full Stop" in Australia, it would've done better here? Their rivals for the boy band throne in the UK, Take That, had yet to make any kind of impact in Australia (although their first local hit wasn't far away), but the bad boys of British pop, East 17, struck gold (literally) with debut single "House Of Love". Named after the postcode for Walthamstow, the area of London from which they originated and the title of their debut album, East 17 were comprised of Tony Mortimer, Brian Harvey, Terry Coldwell and John Hendy. Like Take That's Gary Barlow, Tony was the musical brains of the group - the writer of all their hits and one of their two lead singers. He was also the one who initially attracted the interest of London Records, with A&R exec Tom Watkins (who'd guided Pet Shop Boys and Bros to fame) suggesting he go down the boy band route. And so, he teamed up with the other three members and together they were signed. A blend of rave music and hip-hop, "House Of Love" showcased not only Tony's rapping but also Brian's singing, with the latter emerging as a joint frontman. As for the other two? Well, John and Terry became infamous for, in Tony's words, being "known as the two that don't do anything", but in true boy band-style, they made up numbers and contributed to the group's edgy, bad lad image. The song made it clear from the start that East 17 weren't going to play by the rules when it came to what boy bands typically sang about. No drippy love song, "House Of Love" is a plea for humankind to stop battering the planet - "one more war and she might explode". Not ones to rush things, Go West finally got around to following up their Pretty Woman smash, "King Of Wishful Thinking", two years later with this just as slickly produced - once again by Peter Wolf - pop tune. Although the length of their absence didn't hurt "Faithful" in the UK and the US, going top 20 in both countries, the duo seemed to have lost their momentum in Australia, missing the top 40 and never returning to the top 100 with any of their subsequent singles. While Ralph Tresvant proved unable to break into the top 50, three of his New Edition band-mates finally landed a hit in the wake of their oh-so-brief featured spot on "The Best Things In Life Are Free". A between-albums single, "Gangsta" also restored the group's chart fortunes in the US, where it became their biggest hit since their opening salvo of number 3 hits, "Poison" and "Do Me!". Having got his soul covers album out of his system, Jimmy Barnes was back in a rock frame of mind for his sixth studio album, Heat. Appropriately, the album's lead single was called "Sweat It Out" and its rawer, less commercial sound may be the reason that, after making a splashy debut just outside the top 10, it immediately dropped down the chart, spending just five weeks on the top 50. 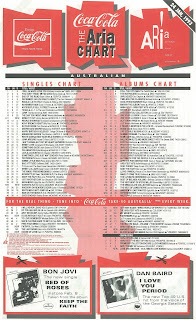 There was bad news for Jimmy on the albums chart, too - Heat became his first post-Cold Chisel album (which included his five previous studio efforts and live album Barnestorming) not to reach number 1. He had to settle for number 2 instead. Next week: a TV band whose hit single was way bigger than the show it came from, plus the first hit by a two-hit wonder band who were never seen on the chart again after 1993. 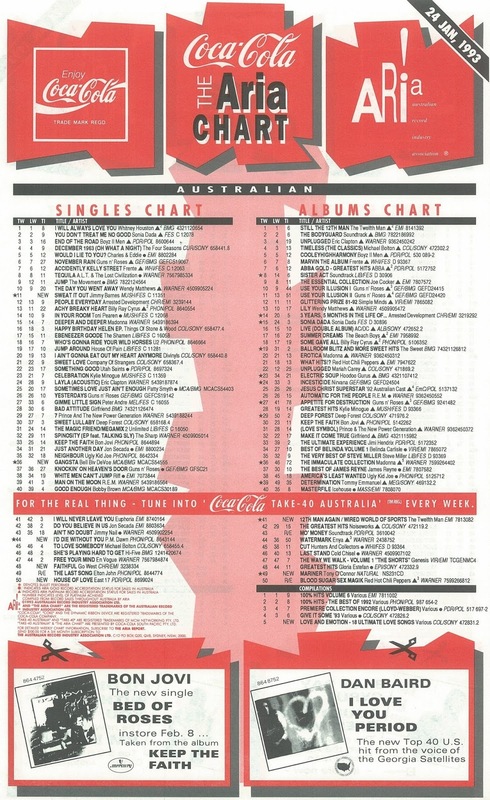 This week seemed to have a few 'hangover' entries from late '92 that took their time to either chart or reach the top 50; with 'Sweat It Out' being the only real 'new' track. The S.O.U.L. S.Y.S.T.E.M. (did anyone actually spell out the letters when announcing the group name?) song is very P.M. Dawn-sounding. I had never heard of 'I Love You Period' until it was being discussed on my table in Ceramics class at school. It felt odd where everyone knew a song that I didn't. Part of the discussion was someone thinking he was singing "I love your period", ha ha. Not being familiar with the American term for a full-stop yet, I didn't quite get it at first, either. I can picture it being sung by Shania, perhaps with some tweaking of the title... "I Love You... Period!" East 17, to me, did not seem to be a 'boy band' until 'Deep'. 'House of Love' was a bit edgier, and I remember even the class troublemaker singing the 'everybody, everybody in the house of love' chant in class one day. The video looks very low budget, too - perhaps in part to create an 'edgier' image? But I don't know what the "likes girls with small feet" thing was about. Or John's role of supposedly being the keyboard player, but never being shown playing it again. I was recently reminded of Terry’s contribution to chorus ad-lib vocals on the awful ‘Around the World’, so he at least did do that for one song. I didn't expect P.M. Dawn to ever have another 'hit' in Australia, following the floppage of the post-'Set Adrift...' singles locally, but this one *almost* got them there. 'Gangsta' seemed to hang around forever despite its #17 peak. I haven't heard 'Sweat It Out' in years. It's very 'Love Junk'/Diesel in parts. East 17! That idiotic dancing in the "House Of Love" video! I'm sure they look back at that and cringe. And those stupid-looking hats that even Girlfriend would turn their noses up at! Ah well, at least the song was pretty good. I also liked their band name and album title, as I used to live in Walthamstow, way back when.